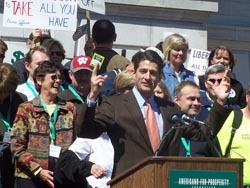 A Wisconsin Congressman helps kick-off a "Tea Party" at the state Capitol. Several thousand people rallied on the steps of the Capitol Wednesday in opposition to higher taxes. Congressman Paul Ryan (R-WI) says the Democrats in charge don&apos;t care about the concerns of taxpayers. He says they just want people to "pay up and shut up." However, Ryan says the strong turn-out at the Madison event shows people want to make their own decisions. The Republican says we don&apos;t bureaucrats running our lives. Ryan says those who think federal tax increases will impact only the wealthiest Americans are mistaken. He says the increases included in the recent federal budget will impact anyone who buys gas and groceries or pays income taxes. The so-called "Tea Party" was one of dozens held across the nation. The Department of Administration usually provides official crowd estimates for large events at the Capitol, but said they will not be doing so this time. Organizers of the Madison Tea Party estimate that over 5,000 people attended the event.